Wolfrathausen, Germany, April 2, 2015 – EIZO today announced the new DuraVision DV4624 – a 46-inch full HD (1920 × 1080) monitor developed for maritime applications. The new monitor expands EIZO’s current line of marine monitors to range from 19 to 46 inches. 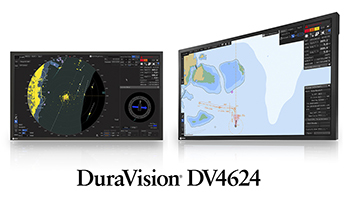 The DuraVision DV4624’s large screen provides ample space for viewing important nautical information from one or more bridge system applications. This allows operators to view a large amount of data conveniently on a single screen for a streamlined workflow. The monitor’s full HD resolution offers vivid display of images and the high contrast ratio of 4000:1 provides exceptionally clarity for distinguishing details. The 178° wide viewing angles minimize changes in contrast and gradation to maintain excellent visibility when the screen is viewed from off center. The DuraVision DV4624 is highly reliable for use in harsh maritime environments, complying with the conditions for temperature, humidity, and vibration as defined in the IEC 60945 international standard for maritime navigation and radio communication equipment and systems. IP55 rating ensures it can withstand dust ingress and is protected against low-pressure water jets. In addition, the stainless steel industrial-grade housing provides exceptional durability. The monitor is equipped with an LED backlight that lasts longer and consumes less power compared to conventional CCFL for optimal reliability and operational efficiency. The wide dimming range of less than 1 cd/m2 up to 700 cd/m2 allows controllers to adjust to the appropriate brightness level for viewing during the day or at night. The DuraVision DV4624 is calibrated at EIZO’s factory so each monitor achieves precise color reproduction for meeting the highly specialized requirements of ECDIS systems. In addition, it comes equipped with hardware calibration functionality using the optional EIZO EACAL-R01 luminance meter for carrying out calibration of the backlight brightness, gamma, and white point quickly and efficiently. No additional software is needed, ensuring calibration operation is non-intrusive to the system. Picture-in-Picture (PiP) functionality allows operators to display a small separate screen from a second signal source within the monitor to effectively view a variety of navigational information at once. The DuraVision DV4624 is now available. Date of availability varies by country so contact the EIZO group company or distributor in your country for details.